Blissfully is a SaaS management platform built for collaboration between HR, IT, and team leaders. 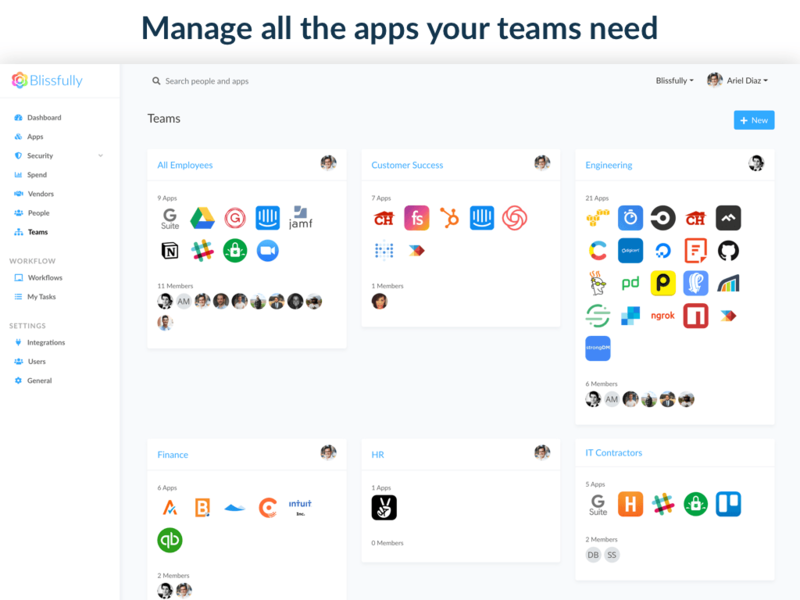 Blissfully and Bamboo create a seamless, and secure, onboarding and offboarding process, allowing you to make sure your employees have access to all the SaaS apps they need and none that they don't. The average employee needs over 10 SaaS apps to do their job. That list of apps constantly changes, creating chaos when a new hire starts. Blissfully automatically maintains an up-to-date inventory of the SaaS apps your organization uses, letting you ensure every new hire has access to the apps they need on day one. 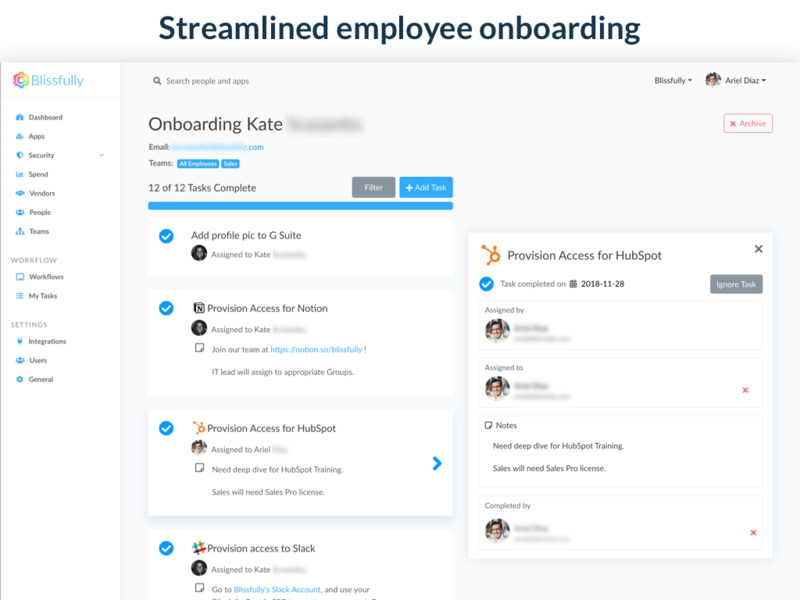 Trigger an onboarding in BambooHR and Blissfully will generate a list of apps to be provisioned, along with who's responsible for provisioning the app - whether that's IT, HR, your team lead, or the new hire themselves. Everyone involved can see which apps have been provisioned and which ones are still needed. A shared workflow and audit log keeps the entire team up to date. Make sure employees that leave are securely removed from all of their SaaS apps. When you trigger an offboarding, you can automate the account back up, revoke access, and terminate a G Suite account from within Blissfully. Blissfully will also generate a list of all the apps that have been provisioned to the employee and send tasks to each account owner to remove their accounts. 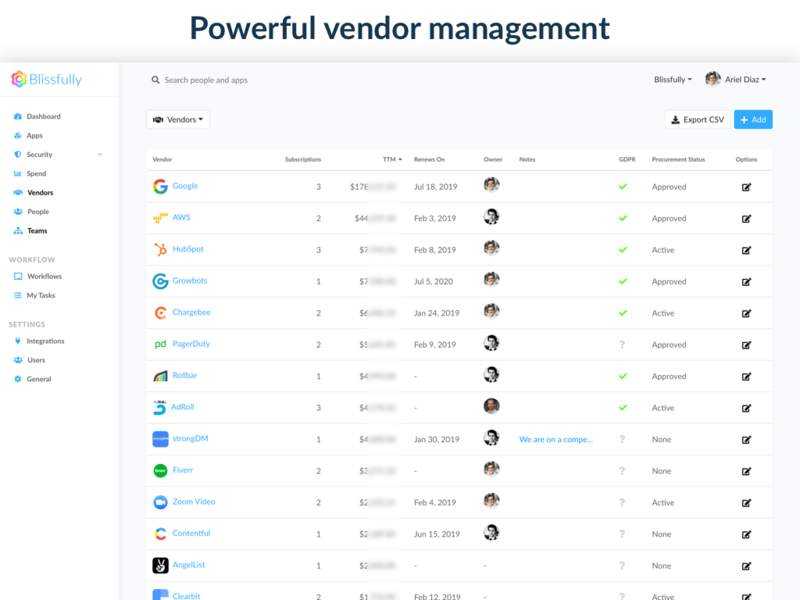 Easily manage everything related to your vendors in one place - contracts, invoices, licenses, and approvals. Create workflows to involve all of your key stakeholders and ensure nothing falls through the cracks. Automatic reminders make sure you'll never miss a renewal again. 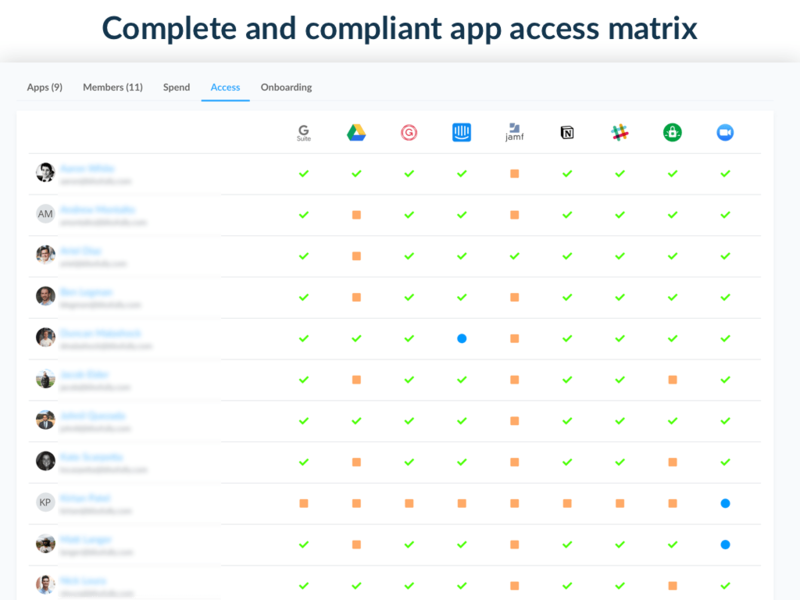 Blissfully automatically creates an audit trail of all the apps an employee has access to, who gave them access, and when it was granted and/or revoked. This real-time system of record allows you to easily search your entire organization by person, app, or team. Export the data to use as a documentation trail for audits and compliance. With Blissfully's BambooHR integration, you can trigger IT centric onboarding workflows in Blissfully whenever you hire a new employee in BambooHR. This enables you to manage SaaS application access and other IT tasks in Blissfully's SaaS management platform. Similarly, you can trigger offboarding workflows when offboarding an employee in BambooHR. Import your teams or departments from BambooHR to Blissfully. Streamline the IT side of on-boarding and off-boarding with complete SaaS management.